Boutique law firms are beginning to look like the future of the legal profession. But what, exactly, does this trendy term mean? A boutique firm's attorneys all specialize in one niche area of practice. 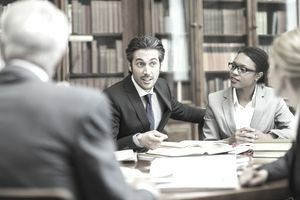 Although most midsize and large law firms have structured themselves to offer a broad range of services, a growing number of lawyers are setting up these smaller practices, choosing to focus the work of the entire firm on one area of the law. This enables them to market their entire firm as specialists—or the closest thing to the term "specialist" that's permitted in their jurisdictions. Boutique law firms tend to be smaller, and small practices are nothing new. The number of solo practitioners in the U.S. remained consistent from 1980 through 2005, according to a 2016 demographics report by the American Bar Association. The number of attorneys active in firms of two to five lawyers dwindled by 8 percent during that same time period, but a boutique firm isn't about size. It's about specialization. Attorneys in boutique law firms are experts in their fields. Should a client have a problem that doesn't fit into the firm's niche, his lawyer doesn't have the option of taking it on anyway. The client is referred elsewhere. In fact, referrals are the backbone of the boutique concept as clients are pointed in the direction of other such firms and—in theory at least—the same courtesy is returned when that firm can't handle a particular case. When certain aspects of an existing case stray from the firm's niche although the case itself conforms, specialists are brought in to deal with that particular area. The National Law Journal highlighted two boutique law firms, both of which broke away from some of the nation's biggest firms. Five attorneys at Neal, Gerber, and Eisenberg in Chicago departed to form Chicago Law Partners, while 15 lawyers at LeClairRyan left to form Murphy & McGonigle. Chicago Law Partners focuses on representing not-for-profit organizations. Murphy & McGonigle handles commercial litigation and the defense of SEC investigations, and it provides regulatory guidance to financial services firms. Both indicate that they can charge lower fees by outsourcing many of the firm's business functions to external services rather than managing them in-house. This frees partners to focus on practicing law rather than dealing with administrative functions. American firms are not the only ones undergoing this type of change. A China Law Blog article discussed how boutique law firms in Asia are drawing business away from the general practice firms. The shift from midsize and large law firms to boutique legal services is driven by a desire to reduce costs as well as to obtain the services of better attorneys with specialized experience.